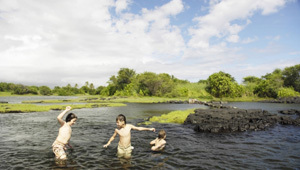 Generations of local children have learned to fish and swim in the tidepools of Honu'apo, on the southern point of Hawa`i's Big Island. The bay is also used for community gatherings and by local fishermen who use traditional native Hawaiian throw-nets. In 2003, the land was sold by the old sugar plantation to new owners and residents feared that the shoreline could be developed. A cooperative effort between residents, government officials, a local community group, and the landowner led to a consensus that these 225 acres should be protected as the county's largest park. In 2006 TPL purchased and held the land until funding for its protection was secured. Funding sources ranged from small donations from community members to a $1 million grant from Hawai`i's recently passed Legacy Lands Act.